Nylon plain. Quick release. Black lacquered accessories. 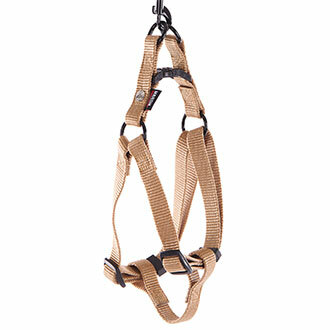 Part of reinforced nylon to protect the stomach on the 3 largest sizes harness. Comfort and support of the animal. Develops the dog's physical, superior traction for the dog. Strap 10 year warranty. There is a ventral reinforcement for the 3 larger sizes.